1) Integrated Daylighting Approach – As daylighting relies on a complex interaction of many different components, Moseley Architects’ designers undertook significant steps to bring these parts together in the right way. Each building on its site follows an east-west (E-W) axis to allow all classrooms to face north or south. Despite different site constraints at each school, both buildings were able to be oriented within 15 degrees of this ideal E-W axis. 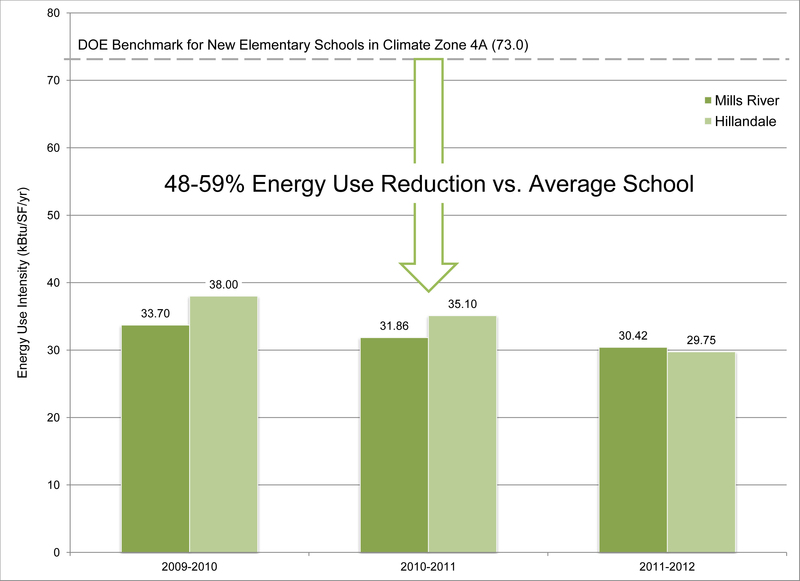 2) Demand-Controlled Ventilation And Dedicated Outside Air Systems – To promote further reductions in energy use, Optima Engineering utilized a combination of Demand-controlled Ventilation (DCV) and Dedicated Outside Air Systems (DOAS) in conjunction with the schools’ water source heat pumps.